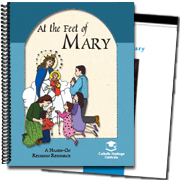 This resource encourages children to draw near to Jesus through love and devotion to His Mother, Mary. Each lesson covers one of the 20 Mysteries of the Rosary with thought-provoking stories, hands-on activities, age-appropriate meditations and discussion-starters, and inspiring, full-color illustrations that present the life of Christ and His Mother through the eyes of a child. At the end of the course your child will have his own book of Rosary meditations and illustrations. Note: the course is not intended to replace your child’s catechism lessons but to develop and enrich them. Appropriate for ages 7-10.